The Char-Griller 2123 Wrangler 640 Square Inch Charcoal Grill Smoker, as the name suggests, is the all in-one-cooking machine, giving the user the option to grill, smoke, and also char-cook food. The state-of-the-art cooking machine is specially designed to prevent any mishap and is completely safe. Great spaciousness provided by the manufacturer prompts it’s users to enjoy a much larger cooking area as compared to other grilling machines. The spacious area in the grill makes it very easy to use it for cooking and serving for large families and parties with large gatherings. This made the grill most suitable for outside cookery. The grill also comes with a heating tray just situated at the lower bottom, which makes it easy to store meat and to keep it warm; not only that, but the warming tray can be used to roast bread as well. The grill is very sturdy and very solidly built; with wheels in the bottom, it makes it hassle free to move around the grill areas. Along with a sturdy structure, the grill is also leak-free from all kinds, whether it is oil or air. The airflow of the grill is supremely mastered along with the temperature control gauge, which is easy to use and makes the grill a complete all-round machine. The assembly manual is not clearly explained, with lots of flaws present in it – be it theoretical and also lacking important information. Many technical flaws present in the machine, one example is that the metal handles become heated whenever something is cooked or the machine is used. The “Airtight” hood is not exactly airtight as the grill leaks air profusely. The products provided to assemble the grill were quite dismal as there were many problems related to welding and basic structure of the grill. Upon usage, due to the heat while cooking, the black paint or covering in the bottom peels off, giving it quite an ugly look. 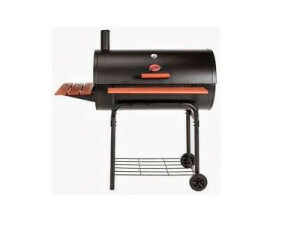 The Char – griller Wrangler grill and smoker is a great product with some definite drawbacks. It could be pretty much used, but keeping the downsides in observation, one would say that with the passage of time, the griller could wither along the way. However, loaded with vast grilling space, capacity of the additional shelves for various purposes, and the complete control of the user, purchasing the product will not necessarily be considered a bad deal.